Especially on a cold morning— when its aroma fills your entire home and waking up every cell in your body. But, not just ordinary coffee will do. Like any other coffee enthusiast out there, I like sipping on all kinds of coffee and experimenting on the extensive menus of coffee shops. But, do you know what I like most? Something that I will order over and over again? So, if you are like me who’s pretty addicted to the heavenly creaminess they bring, then you might want to try making one of your own. You could do just that and unleash your inner barista with the best latte and cappuccino machines at your disposal! Why Invest in Latte and Cappuccino Machine When I Can Just Buy My Coffee At The Coffee Shop? Uhm, I think you pretty much answered that question there. Why buy your lattes or cappuccinos at the coffee shop? Don’t get me wrong, I do buy lattes or cappuccinos at my local coffee shop, but I do so when I’m already out and taking a break from grocery shopping. Unless you are a fan of overpaying for a cup of coffee and standing in lines every time you want a coffee, I don’t really see how you would think that buying cappuccinos and lattes at a coffee shop beats having your own best latte and cappuccino machine at home. First and foremost, getting your own latte and cappuccino machine will save you lots of money. Although, buying your own coffee machine seems like a massive purchase, but how much do you think you spend in your local café monthly? But, kidding aside, I’m guessing you could pay off the best latte and cappuccino machine easily with that sum, couldn’t you? Oh, and it is more convenient that way! You do not have to plan your entire morning around waiting on a long line in your local coffee shop. You only see in, create your own cappuccino or latte (whichever you like) and start the day at your own. Sounds hassle-free, right? It is way more fun figuring everything out on your own, creating your own lattes and cappuccinos, experimenting with various flavors and maybe mastering the art of decorating your cappuccinos and lattes with those intricate patterns and shapes that will surely WOW your family and guests every time they visit you. Tell me that does not sound exciting at all and I will delete this article, right away! I’ve been talking about latte and cappuccinos for some time now, but for the new coffee lover, it might sound confusing. Latte (also known as Caffé latte) and cappuccino are the 2 most popular Italian coffee drinks and are both prepared using creamy, hot milk. But, they do have their own differences. It is an espresso-based milky coffee drink with 1 – 3 or 1 – 9, espresso to milk ration. It is nothing else than milk with coffee. It is quite popular since the coffee content is quite diluted and the standard recipe can be tweaked by adding different flavors, creating latte a dessert. Its frothed milk layer also allows baristas to create intricate patterns and beautiful drawings. Anther espresso-based drink, Cappuccino is a stronger coffee with equal volumes espresso, frothed milk, and steamed milk. So, as you can see, the main difference between latte and cappuccino is its milk content— latte is creamier thanks to its greater amount of milk, whereas cappuccino is just a milder coffee. The coffee to milk ration of cappuccinos is about 1 – 1.5, considering that the foamed milk is at least double in amount compared to steam milk. Cappuccino offers a bold and rich taste, like any espresso coffee would, but is slightly toned down, due to the steamed milk. A single shot of espresso which should not be drip or instant coffee. Now, for the newbies, I understand that you might be confused. We’re talking about latte and cappuccino machines, how come espresso machines suddenly appeared! Lattes and cappuccinos are made with espresso machines. Both coffee needs espresso coffee as their base. People use different recipes for lattes since the amount of milk sometimes covers the coffee taste. However, for the authentic cappuccino taste, real espresso is the best choice. And both can be achieved with a great espresso machine. If you are a die-hard latte and cappuccino lover, have a generous budget and do not mind relinquishing full control over the brewing process, then the super-automatic espresso machines are for you. These machines can do everything for you— from milk steaming to micro-foaming. You can even adjust the setting in order to create minor tweaks to your brew. So that every time you press the button, you will get exactly the same brew! You usually do not get that in coffee shops since every barista uses a slightly different technique in creating their coffees, especially lattes and cappuccinos. For consistency of texture and flavor, super-auto machines are the best. Another great feature of these machines is the micro-foam they produce. You simply cannot replicate the velvety and smooth texture of the froth that a super-auto machine using regular milk frothers. If you’re tight n budget, and you already have a decent barista skill or just want a mix of convenience and control, then a semi-automatic espresso machine should give that to you. Also, if latte and cappuccino art is your thing, then semi-automatic machines are perfect. The only thing you need to consider with semi-autos is the number of drinks they can create. If you wish to create several cappuccinos and lattes at a time, then look for one that has 2 boilers— one for steaming milk and one for espresso. A single boiler machine is fine if you only need to create cappuccino or latte for yourself, however, it will be too slow if you want to serve multiple drinks to your guests. When buying the best ate and cappuccino machine, there are very important considerations you need to check. This is to make sure that you do not get an inappropriate device which does not suit your need. Here are some of the considerations you should check before making a purchase. Sure, it may look simple when the barista does it. However, once you are the one controlling those control keys, levers and whatnot, you will probably wish that you bought a more user-friendly latte and cappuccino machine. If you are new to making cappuccinos and lattes, never fool yourself that you can try the more advanced model from the beginning. Oh, and by the way, ease of use also means ease of cleaning. IT should not take about forever just to take the machine apart, washing everything and putting it back together. A complicated cleaning process typically results in giving up on using the machine entirely. You also need to figure out where you are going to put your new latte and cappuccino machine. Is it an additional kitchen appliance that satisfies your specialty coffee cravings or is it going to replace your old coffee maker? This is because you need to make sure that you have enough space for it in your kitchen, particularly if you plan on using it to create creamy lattes and cappuccino every single day! How many people want your coffee? You need to choose a tank size depending on the answer. Larger reservoirs simply mean fewer refills. And trust me that when it is finally time to show off your newly discovered barista skills in front of your guests and friends, a substantial reservoir is truly a life-saver. In terms of cleaning and maintenance, I would also like to point out that removable water tanks are a big plus! Choose a latte and cappuccino machine which can work according to your desired speed. This is quite important, particularly in a busy environment where you will need a machine that will work at a faster rate when you are late for work. So, how much are you willing to spend to hone your barista skills and start creating your own lattes and cappuccinos? Prices vary drastically, depending on the model and features of the machine— from around a hundred dollars to a thousand. So, where do your budget limit fall? I do not recommend letting the cost of the machine be the primary factor of your purchase. Even if you chose a lower end latte and cappuccino machine, you can always make sure that it has at least a couple of crucial features that you want. Otherwise, you will probably just regret purchasing it in the first place. This entry level cappuccino and latte maker eliminates all the guesswork that goes into steaming your own milk since the machine already does it by itself. Everything about this machine is automatic and all you need to do s to make sure that all the needed ingredients are in place, press the appropriate button an wait for your latte or cappuccino. Simplicity, it the right term for this machine. Just fill the water tank, the milk tank if you plan on making a cappuccino or latte, put your coffee in the ground baskets, click a button to choose what you are making and that’s it! You will be making lattes, cappuccinos, and espresso in just a few seconds. It also has a large 55 oz. the reservoir that allows you to brew one cup from another without refilling the tank. Also, it can be easily removed for refilling and cleaning. Cleaning is also automatic with this machine with is Programmed Cleaning Cycle. 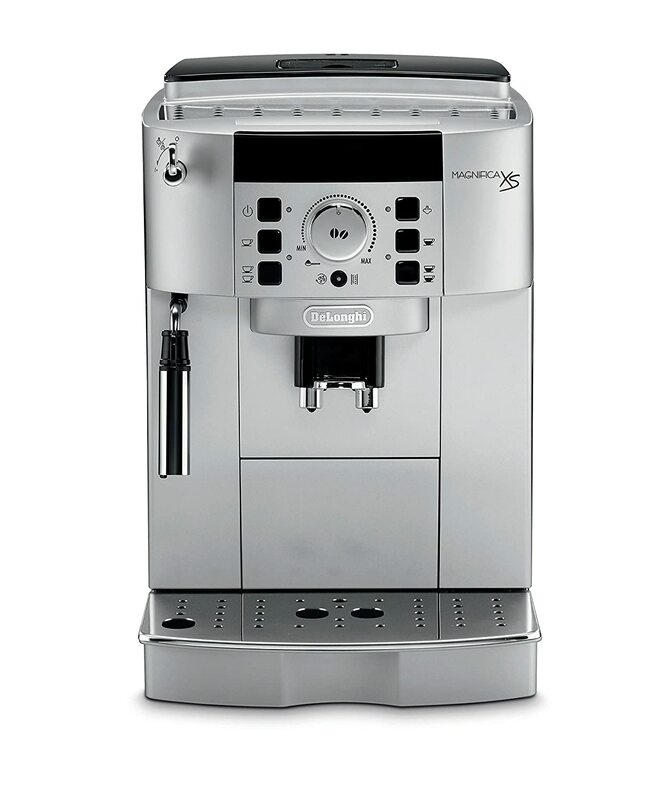 The DeLonghi Magnifica XS offers you the Italian versatility and expertise packed in this elegant model! This compact espresso, latte and cappuccino machine has a stainless drip tray, water tank, and ground bins which slide out to the front of the machine. Its 60 ounces water tank is removable and ground bins can hold up to 14 single espressos. It has a professional burr grinder with a total of 13 adjustable settings that grinds fresh beans every time in order to ensure freshness. 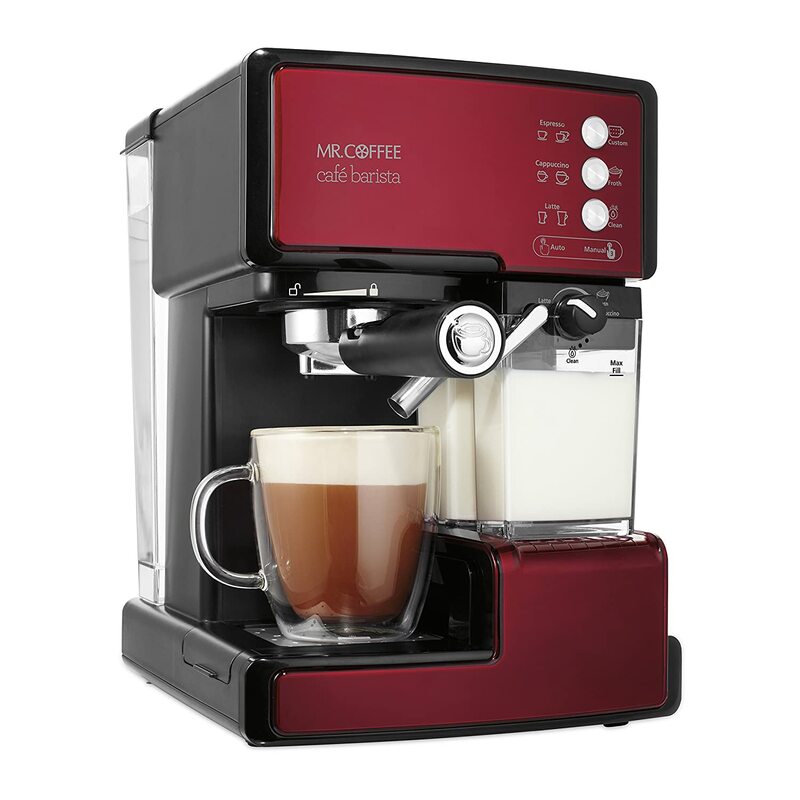 It has an adjustable manual Cappuccino system that mixes milk and steam in order to create thick and long lasting foam. Easy to use, you only need to adjust the menu settings for temperature, cup size and coffee strength and the machine will take care of the rest! 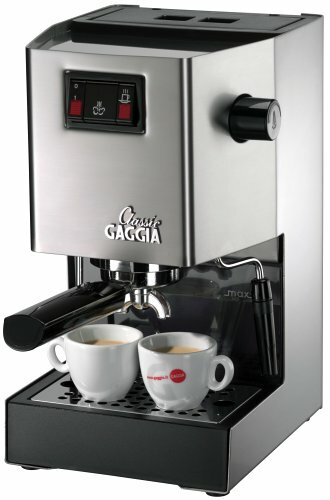 The Magnifica XS also self-adjusts for a single or two shots of espresso and brings consistent brewing every time! 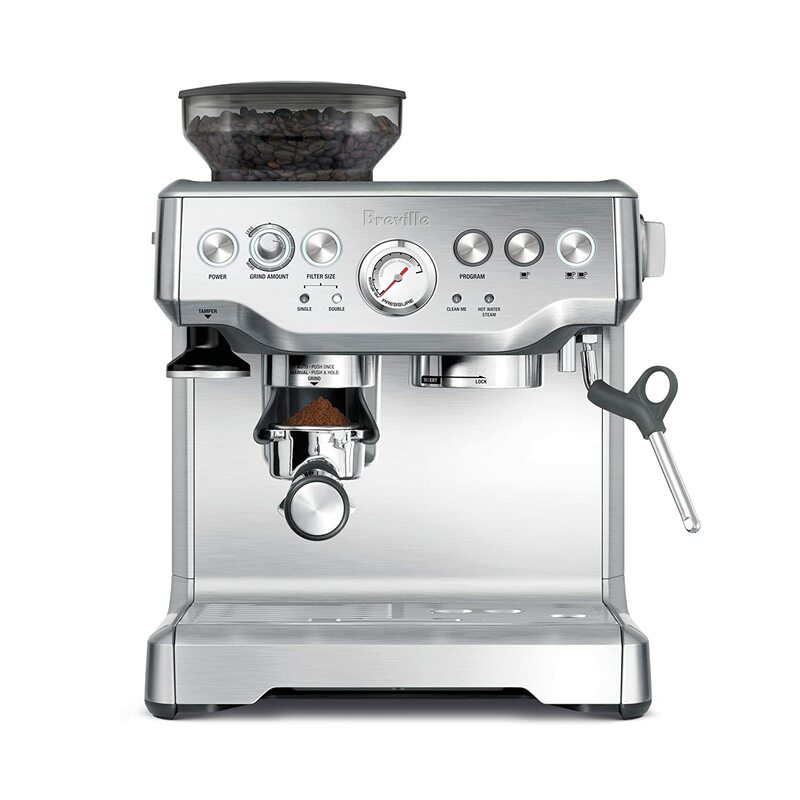 The Breville Barista Express is among the favorite latte and cappuccino maker on this list. If you really want something that is close to professional so you can create some latte and cappuccino art and be a true home barista, this machine is the right one for you! It is a feature-rich coffee maker with just a small footprint so that it does not take up too much of your valuable counter space. With a 67 oz. removable water tank, you do not need to frequently refill it after every few cups. Featuring a built-in conical burr grinder, you can grind beans and also choose both the grind dose and size. The machine comes with digital temperature control in order to ensure that you always get a precise espresso extraction. And there is also an auto purge function which helps ensure optimal extraction. In terms of latte making, its 360-degree swivel steam wand is a joy to use since it makes milk steaming effortless. If you tend to make a lot of coffee every day, then the 72 ox water tank capacity of this latte and cappuccino maker from Gaggia should be perfect for you! Other than having the largest capacity among our latte and cappuccino reviews, this espresso machine is well-built with sturdy stainless steel housing and commercial components such as the 58mm portafilter that makes it durable and longer-lasting. Frothing milk for cappuccinos and lattes is also super easy, thanks to the efficient Pannarello wand which can also be used for dispensing hot water. Featuring a dual boiler, this coffee maker can heat water faster than most espresso machines, making it ready to brew in under 5 minutes and ready to steam in 20 seconds. Operating is also super easy with user-friendly rocker switches. The machine itself is easy to assemble. And if that is not enough, Gaggia also provided a very clear installation instruction manual for your convenience. Lightweight, compact, tiny footprint and fully equipped with ergonomic handles, the Nespresso Inissia fits perfectly into any interior design and is available n different colors to find the right one for your kitchen counter. With this machine, you do not need to wait for it to warm up. In a single touch and less than 25 seconds, the water will reach the ideal temperature in order to create 9 cups of coffees with its 24 oz. water tank capacity. 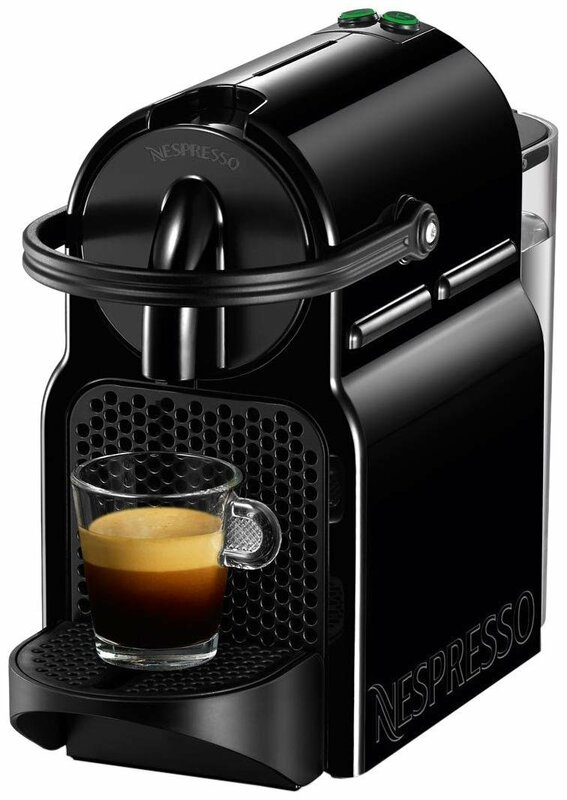 And you can even adjust the cup size with its 2 programmable buttons— Lungo and Espresso. It offers great barista-style tasting, thanks to its single-touch operation and patented extraction system that delivers up to 19 bar pressure. It has a folding cup tray that can accommodate tall recipe glasses and used capsule container can hold at least 9 – 11 capsules. Energy-efficient, this latte, and cappuccino machine automatically switch off after 9 minutes in order to save energy. A favorite, this latte and cappuccino maker unleashes the barista in you and allows you to master the art of latte and cappuccino arts! It is compact and comes with a decent water tank so you do not have to refill it every now and then! Oh, and the built-in burr grinder is pretty useful, too! And yes, it is super easy to use and clean! Smooth and creamy coffee drinks are definitely one of life’s little pressure. Cappuccino and latte make even the most stressful or lazy day manageable and a bit sweet! And with the best latte and cappuccino maker at your disposal, you can always get your hand on sweet lattes or frothy cappuccinos without standing on long lines, ever again! I hope you find this article helpful. If you have questions or suggestions, feel free to voice it out and hit up the comment section below! Until then, have a sweet and smooth day! Copyright 2018 by Cooky Mom. All rights reserved.